The 1960s were surely a time to be alive! Important figures like John F. Kennedy and Martin Luther King were relevant at the time. A man landed on the moon for the first time! Spiderman was introduced to the comic world and last, but not least, the fashion- Oh the fashion!- Was absolutely stunning for it’s time! Especially when it came to hairstyles. The ’60s produced so many different types of hairstyles and haircuts! From the beehive to the bouffant to the flip- We have all the most important hairstyles of the 1960s laid out for you below. And the best part!? These are all looks that would definitely look great on you in 2018. These are 30 of the best 1960s hairstyles that are totally timeless. One thing we know about the ’60s? Big hair was everything. And we mean big. The bigger the bettter! Every woman wore her hair in a big updo at one point or another. They would often add in things such as ribbons, flowers, etc. to their updos to add a bit of flair. You can see an example by looking at the above photo. Hot rollers were a very popular method to use when it came to creating curly hair. Back then they did not have fancy wands or curling irons to help get curls. Instead they would have to use hot rollers and usually leve them in overnight to get the curls that they desired. Beehives were one of the most adored hairstyles of the ’60s. 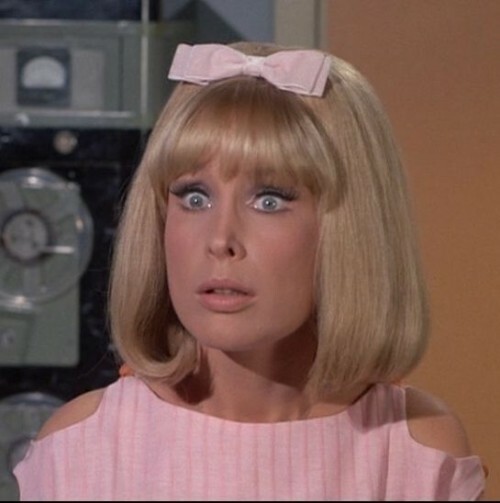 Almost every woman and girl tried out this hairstyle at some point if they were living through the 1960s. Beehives were named because the way that they are set up resembles an actual, real life beehive. It’s a hairdo where all the hair (or in this case, half) is pile into a mound that looks like a beehive. 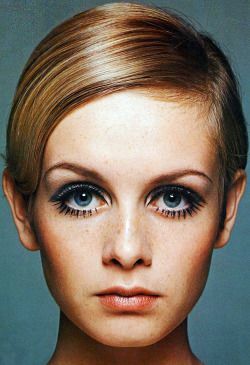 Twiggy was a very famous model in the 1960s. And with her, came this unique (at the time, anyways) hairstyle. She wore her hair in a short fashion, with the bangs pushed off to the side. This was a time before side swept bangs were popular among women. However, she made them work for the time period. People loved it! The flip was a very common hairstyle you would see on women in the 1960s! It was a very easy to do hairdo and worn by many celebrities. What is the flip? It’s just normal hair with flipped out ends! Very easy to achieve with rollers at the time. Victory rolls were also another very common hairstyle seen in the decade of the ’60s. These rolls were created by just rolling pieces of hair up and away from the face and back onto the head. They were worn by many pin up girls at this time. They became trendy in the 1940s and stayed trendy well into the late ’60s. Victory rolls worked with updos and downdos all the same. You could wear your hair down and still rock them. Or, if you wanted, you could wear your hair in a tight updo and complement it with victory rolls on top. You might even do them through your entire head and pin them back to create the updo. The French twist was not just worn by the French. Nope, it was a very adored hairstyle that swept across the globe in the 1960s. 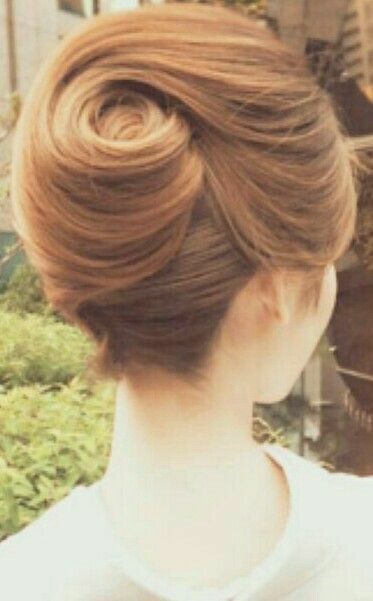 It was a simple hairstyle to achieve, but radiated class and elegance. All you had to do was twist your hair up in a specific fashion and you had this gorgeous hairstyle. Here’s a word you may never have heard before today: Bouffant. And no, it’s not somewhere you can load up on food over and over again. A bouffant was a very well liked hairstyle back in the ’60s. A bouffant comes in many different variations, but each one ensures the hair is raised high on the head and usually hangs down at the sides. Like we said, there are many different variations of the bouffant. It was one of the most worn hairstyles of the ’60s, because there was just so much that you could do with it! You could add a front bow and create a glamorous look such as the one above. Marilyn Monroe was famous for many things, but one of the best things was her hairstyle. She was well known for her pin curler curls! These types of curls are created by using pins to hold the hair into place while it sets. So instead of hot rollers or curlers, pins were used! Classy hairstyles like this were all the rage back in the 1960s. Every women wanted to be graceful, sleek and classy. 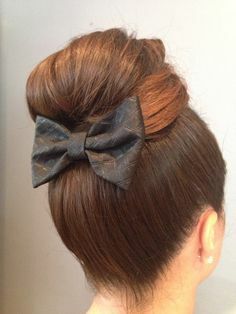 Tight buns were a common occurance in that day and it was not unusual to add a ribbon or a bow to pull the look together. Some women chose to wear all their hair curled from curlers, while others chose to only curl the bangs up and backwards away from the face. This is a great look and we definitely could see it making a major comeback in 2018-2019! What do you think? 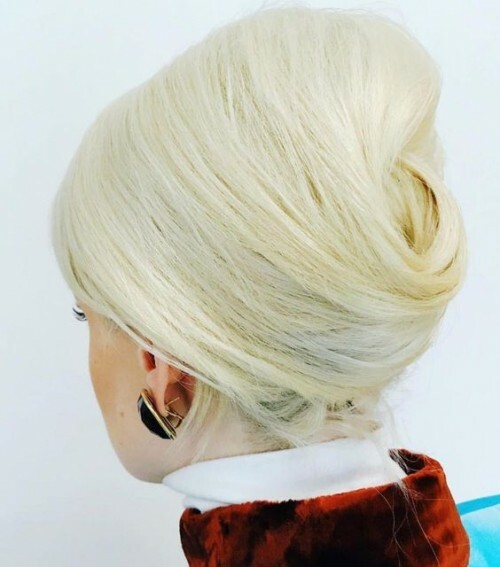 This down hairdo is a prime example of what a classic beehive hairstyle looked like back in the 1960s. You would find this hairstyle on magazines, in movies and on the street everywhere! It was definitely the hairstyle to have in the 1960s. An easy hairstyle from the 1960s? Twisted back sides. This was usually paired with loosely curled, long hair, but would work with straight hair as well. This was another pin up style look that was very common. 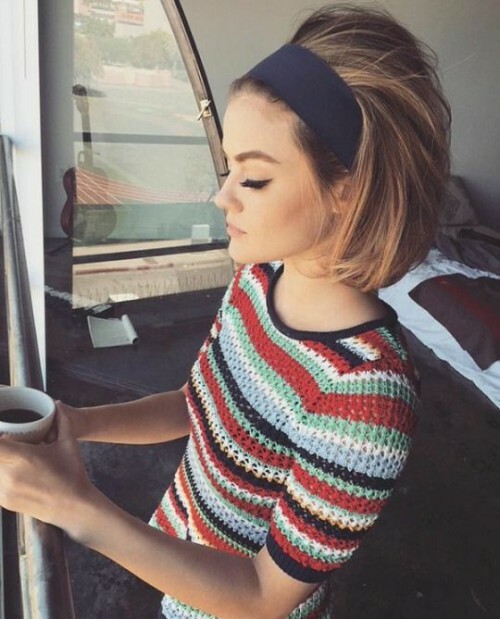 The bob started growing more and more popular during the swinging sixties and we totally get why. This hairstyle was beautiful and is still very commonly worn even today. Bobs will forever be timeless. You would often see a bob haircut paired with a beehive hairstyle back then. Bouffants came in many different shapes and sizes. One of them being like shown above. You could find women with curly hair or short hair sporting this hairstyle during the 1960s. This women chose to wear her bouffant with her short, curly hair. And we love it. 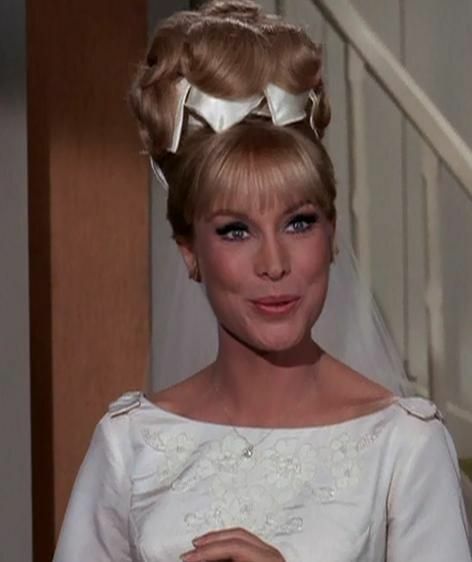 It is definitely one of the best hairstyles of the ’60s. Who doesn’t love a good half pony? Even today they still rock! But the girls in the ’60s were surely rocking the look back then. They would commonly wear this hairstyle and then put a ribbon around the ponytail. Are you searching for a more high end 1960s hairstyle? No problem! Just take a gander at this beautiful, chic twisted up bun hairdo shown above. This was a great look for formal dates and cocktail parties. And it would probably work for the same occasions in this day and age, too. We may have mentioned this before, but for good measure we might as well mention it again… Big hair was better back in the 1960s. Teasing your hair was becoming a more common occurance when it came to fashion. That’s why styles like the bouffant and beehive were so well liked. High ponytails were just becoming popular in the ’60s. Pairing it with a beehive was the ultimate look! Girls everywhere wore this hairstyle with pride. It was definitely one of the best hairstyles there was at the time! We love this style of beehive hair! We like that it’s all wrapped up and kept up with a headband. Headbands and ribbons were very well liked at the time and worn by many young women and girls everywhere. Beehives were the epitome of women’s hair fashion! Teasing the top of the hair to create a bouffant look was the thing to do back in the 1960s. But what made it even better was adding curler curls at the ends. This was a classic style that women wore back then. We see no reason as to why it shouldn’t make a modern day comeback. Do you? Can you tell that bows were super loved back in the ’60s? Bows and ribbons and headbands took the fashion world over! We love this simple, classic style paired with a cute pink bow. It’s totally adorable in every way. 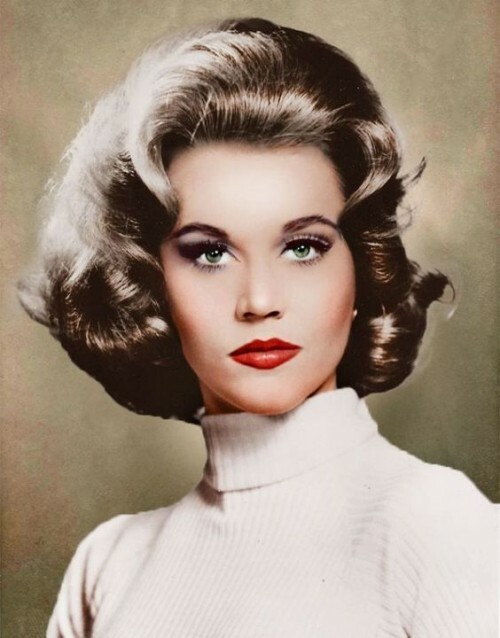 We have shown you just about every type of beehive hairstyle that there was in the 1960s, but we have yet to introduce you to this spectacular masterpiece. The beehive updo was a beehive shaped bun! We adore it! Messy buns were not yet created at this time. So when women did updos they did classy updos. Not a single hair was to be out of place. Everything would be sleek and chic! Updos like this were commonly seen on the television and in movies worn by actresses. Like we just said, not a hair was to be out of place when it came to updos in the 1960s! Women were to appear prim and proper. Especially when it came to their hairstyles. This style was worn often by people like Audrey Hepburn and other famous characters! 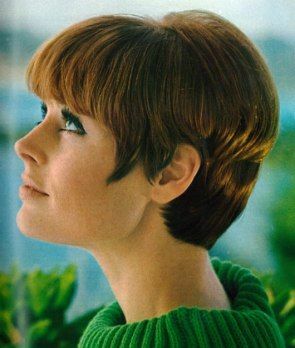 You didn’t think we’d pass up putting a pixie cut on the best hairstyles of the ’60s list, did you? Of course we wouldn’t! Pixies weren’t all too popular back then, because it made women appear less feminine. However, there were a few brave girls who chopped it all off to sport this style. Headbands were seen everywhere and often back then. Women utilized them very well in day to day fashion. Whether your hair was up or down, a headband would definitely complement the look better than just leaving the look by itself! 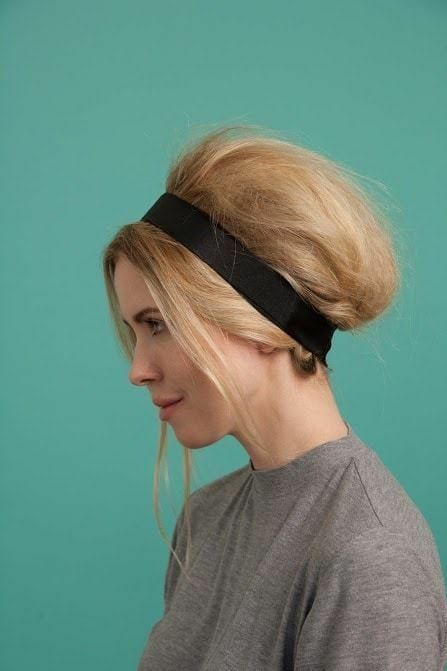 The last of the lovely bouffant looks that we have to show you is the pulled back bouffant. This was just a low pony tail with high, teased hair on the top. Can you see why the bouffant was one of the best hairstyles of the ’60s? ‘Cause we sure can! A classic short hairstyle from the 1960s looks just like the one Claudia Cardinale is wearing in the photo above. Usually there were bangs and flipped out ends to create this lovely, beautiful look!